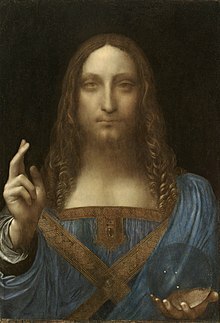 Salvator Mundi by Leonardo da Vinci (c. 1500) is the most expensive painting ever sold as of 2018. This is a list of the highest known prices paid for paintings. The current record price is approximately $450 million paid for Leonardo da Vinci's Salvator Mundi in November 2017. The most famous paintings, especially old master works done before 1803, are generally owned or held at museums, for viewing by patrons. Since the museums rarely sell them they are considered priceless. Guinness World Records lists da Vinci's Mona Lisa as having the highest ever insurance value for a painting. On permanent display at the Louvre in Paris, the Mona Lisa was assessed at US$100 million on December 14, 1962. Taking inflation into account, the 1962 value would be around US$830 million in 2018. The earliest sale on the list below (Vase with Fifteen Sunflowers by Vincent van Gogh) is from March 1987; with a price of £24.75 million (£68.4 million in 2018 dollars). This sale tripled the previous record, and introduced a new era in top art sales. Before this, the highest absolute price paid for a painting was £8.1 million (£18.9 million in 2018 dollars) paid by the J. Paul Getty Museum for Andrea Mantegna's Adoration of the Magi at Christie's in London on April 18, 1985. In constant dollars, the highest price paid before 1987 was by the National Gallery of Art when in February 1967 they acquired Leonardo da Vinci's Ginevra de' Benci for around $5 million ($38 million in 2018 dollars) from the Princely Family of Liechtenstein. The sale of Van Gogh's Sunflowers was the first time a "modern" (in this case 1888) painting became the record holder, as opposed to the old master paintings which previously had dominated the market. In contrast, there are currently only nine pre-1875 paintings among the listed top 89, and none created between 1635 and 1874. An exceptional case is graffiti artist David Choe, who accepted payment in shares for painting graffiti art in the headquarters of a fledgling Facebook. His shares were of limited value when he was given them, but by the time of Facebook's IPO they were valued at around $200m. Vincent van Gogh, Pablo Picasso, and Andy Warhol are by far the best-represented artists in the list. Whereas Picasso and Warhol became wealthy men, Van Gogh is known to have sold only one painting in his lifetime, The Red Vineyard, for 400 francs (approximately $2,000 in 2018 dollars) to the impressionist painter and heiress Anna Boch. Prices realised for just his nine paintings listed below, when adjusted for inflation to 2017, add up to over $900 million. Georgia O'Keeffe holds the record for the highest price paid for a painting by a woman. On 20 November 2014 at Sotheby's, the Crystal Bridges Museum of American Art bought her 1932 painting Jimson Weed/White Flower No. 1 for $44.4 million (equivalent to $47.0 million in 2018). This list is ordered by consumer price index inflation-adjusted value (in bold) in millions of United States dollars in 2018. [note 1] Where necessary, the price is first converted to dollars using the exchange rate at the time the painting was sold. The inflation adjustment may change as recent inflation rates are often revised. A list in another currency may be in a slightly different order due to exchange-rate fluctuations. Paintings are listed only once, i.e. for the highest price sold. Portrait of John Edwards Francis Bacon 1984 May 13, 2014 Private Collection Anonymous Christie's, New York. [note 22] Pablo Picasso 1905 November 28, 1988 3 Roger Janssen heirs? $63.5 Police Gazette Willem de Kooning 1955 October 12, 2006 David Geffen Steven A. Cohen Private sale via Richard Gray. $67.45 La Gommeuse Pablo Picasso 1901 November 5, 2015 William I. Koch Sotheby's, New York. This page is based on the Wikipedia article List of most expensive paintings; it is used under the Creative Commons Attribution-ShareAlike 3.0 Unported License (CC-BY-SA). You may redistribute it, verbatim or modified, providing that you comply with the terms of the CC-BY-SA.